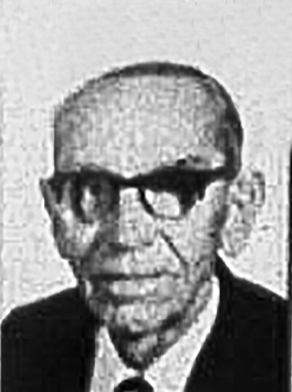 James Henry Deacon, alderman on Northcott / South Sydney Council in 1969-71 (City of Sydney Archives CRS 307/87). James Henry (Tim) Deacon was born on 1 August 1904 in Sydney, he was the illegitimate son of 19-year-old Violet Deacon. He married Ada Teresa McDermott (1906-98) on 17 March 1927 in Redfern, NSW and they had two sons, Cecil and Keith. Deacon died on 17 February 1971 at Warrimoo, NSW (late of Waterloo), aged 66 years. He was buried in the Catholic Section of Botany Cemetery. He lived at 62 Walker Street, Waterloo. A reserve in Alexandria was named James Henry Deacon Rest Area by a Resolution of Council on 13 November 1967, to honour “a lifelong and highly respected resident of the Waterloo district of the City, who was an alderman of the former Waterloo Municipal Council, and who has contributed greatly over a period of many years towards the welfare of pensioners in the area” (SSMC Correspondence item 1026 container 2491). Deacon was a justice of the peace (JP). James Henry Deacon was an alderman of Waterloo Borough Council in 1947-48, and later of South Sydney Municipal Council from its inception in 1969 until his death on 17 February 1971.